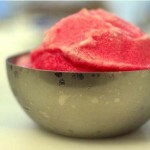 UPDATE DECEMBER 2010: This has become one of our favorite homemade ice creams. As with everything that passes through our kitchen, the recipe has been modified over time. Here’s the new version. Refrigerate the coconut cream in advance. 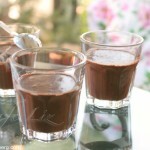 Mix the water with the cocoa and the sugar; heating the water may help the sugar dissolve. Cool the cocoa mixture in the fridge. Mix with the coconut cream. If you want a lighter ice cream, you can add up to two cups more water. Freeze in your ice cream maker for about half an hour or according to the manufacturer’s instructions, until you have a soft ice cream. 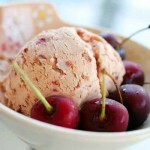 Transfer to a container and put in your freezer until the ice cream has hardened, usually a few hours. 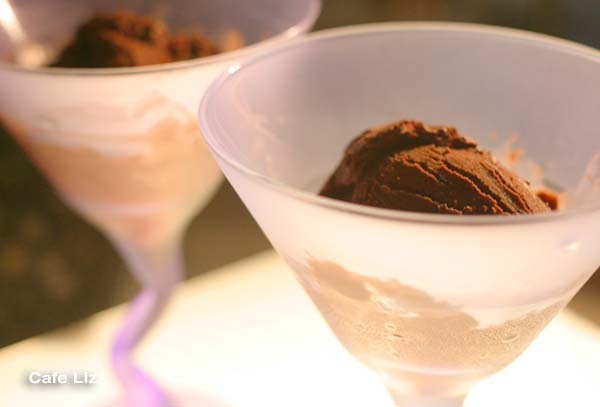 We’re still experimenting with our new ice cream maker, and here’s one combination we tried: Chocolate coconut sorbet. This light, vegan sorbet has a strong dark chocolate flavor with hints of cinnamon and coconut. If you want a more prominent coconut flavor, add less cocoa powder — only one cup. Mix the cocoa powder, sugar, salt and cinnamon in a bowl. Stir in the coconut milk slowly, so that the dry ingredients don’t lump. Add the water. Cool to refrigerator temperature. 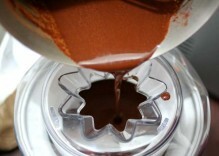 Freeze in ice-cream maker for about 1/2 hour our until you have a soft ice cream. Let firm in the freezer for another few hours. The entire batch has about 1650 calories in it. I think we’ll get at least 12 servings out of this, which means each serving is about 130 calories — not bad for chocolate. 3 Responses to "Chocolate coconut sorbet"
Thanks, Claudia! The coconut is actually quite a mild flavor, in my opinion.